Our second Dumpster Day of 2018 is this Saturday September 8th. This is your second chance to clean out your house and do a little fall cleaning. Get rid of that pile of stuff taking up unwanted room in your garage or basement. It’s also a great chance to clean up your yard and bring those piles of sticks or yard waste that has kept growing all spring and summer long. WHO: Oak Meyer Gardens residents who are current on their annual dues. WHEN: Saturday September 8, 2018 from 8 AM – 11 AM. WHAT: We will have 2 trash dumpsters and 1 yard waste dumpster. Dumpsters are for common household trash only. Please do not place leaves and brush, tires, household hazardous waste or appliances in the dumpster. If you have household hazardous waste that needs to be disposed, please visit recyclespot.org to learn more about where and when to dispose it. Only leaves and brush are allowed in the dumpster. Yard debris must be in a paper lawn bag or a cardboard box. Tree limbs can be up to 10″ in diameter and 6′ in length. Please do not place plastic bags or trash in the dumpster. The State of Missouri does not allow leaves and brush in the landfill. Oak Meyer Garden’s Second Annual Ice Cream Social will take place Sunday, August 19th from 4:00 to 6:00 pm. There is a NEW LOCATION. Academie Lafayette has graciously allowed us to use their parking lot/play ground in the back of their facility at 69th and Oak Street. Betty Rae’s Ice Cream Truck will be there serving all the free, delicious ice cream you can eat – until it is gone. This year we are combining the Social with an important, historical event for our Members. We will be voting on the proposed new Bylaws as well. A link to the Bylaws document may be found at the post below, so please take some time to review them before you come. The vote will be by written ballot, so you may vote at any time during the event. Please stop by, take a moment to vote, and enjoy some ice cream with your neighbors. See updates and edits in bold. Starting this year Oak Meyers Gardens residents are going to be able to participate in a neighborhood wide leaf pickup program that is special to our OMG neighborhood and separate from any leaf pickup programs provided by the city or county. Our first pilot and test run of our leaf pickup will be the week of December 11th. Since this is a pilot program, we are unsure of neighbor participation along with how long the pickup will take. At the request of the company performing the work we are dividing the neighborhood into 3 sections. Based on where you live will determine your pickup date. Leaves must be out onto the street no later than 7 am of the morning of your pickup. Leaves are NOT to be bagged up. Please leave them loose. The crews will pickup leaves located in the street, from the curb out to about 2 feet from the curb. To be picked up, leaves need to be raked or blown into 1-5 piles in the street to be sucked up by the vacuum truck. The crews will NOT pickup any sticks, twigs, branches, etc. This is a leaf only pickup. If you live on a busier neighborhood street (Oak, Rockhill, Holmes, Meyer, or 63rd) and live on a corner, please put your leaves onto the quieter side street. If you do not live on a corner, in front of your house is fine. This just helps reduce traffic issues on the busier streets. This is a service for all neighbors who have blown or raked out of their yards into the streets and into piles for pickup. It not intended to remove leaves that have just fallen in the streets or have ended up out there naturally. The crews will not be just sucking up all leaves along all curbs in the neighborhood. *Reminder: This is a service provided by the homes association for all homeowners and while the company providing the pickup will attempt to pickup all leaves possible, we cannot account for changes in weather or wind that may blow leaves back into yards or further out into street. Or if rain comes through and leaves are wet they may not be entirely sucked up by the vacuum truck. *Note: If your leaves are not picked up on your scheduled date, please email JerryRowan@gmail.com immediately and the crews will be notified to come back. This is our first time doing this so we are trying to plan for as many contingencies as possible, but please understand that as a pilot program there may be a few kinks to work out so that 2018 is even better! Section 1 – Monday 12/11: This is all houses north of 69th Street down to Rockhill Rd (both sides of Rockhill). This includes houses on the East Side of Oak Street and the West side of Holmes. Section 2 – Tuesday 12/12: This is all houses going north from Rockhill down to, and including all houses on each side of 65th Terrace. This is for houses on east side of Oak and West side of Holmes. Section 3 – Wednesday 12/13: This is all houses on both sides of 65th St going down to 63rd Street (there are no houses on 63rd Street officially and so really goes to 63rd Terrace) and includes houses on East side of Oak and West side of Holmes. What: The annual homes association meeting to review 2017 financials and events along with presenting upcoming projects, services, and new operating budget. Opening, and review of 2017 neighborhood statistics, projects, events, and other news. *Note, all leaves and brush must be in brown paper bags and limbs must be bundled up per requirement of city. For this pilot program the neighborhood is being divided into 3 sections. If you live on Rockhill or south to 69th St. your pickup day will be Monday 12/11. If you live between 66th Street and Rockhill Rd your pickup will be Tuesday 12/12. If you live between 63rd Street and 66th Street your pickup will be Wednesday 12/31. This year we will be touring the neighborhood and designating one of our neighbors home as the 2017 OMG Holiday House. The winner will get some fun prizes and the distinction of having the best holiday display in OMG! OMG Beautification Committee: This committee’s main objective is overseeing neighborhood common areas and work to improve / maintain the beauty of Oak Meyer Gardens in general. This includes working with our landscape contractor to coordinate perennial and annual plantings. Committee is asked to give monthly update to the board via email or presentation at board meetings. OMG Social Committee: This committee’s objective is to encourage socializing among neighbors and enhance the already strong community feel of Oak Meyer Gardens. This committee will plan and execute OMG summer social and dumpster day, along with creating more regular social events for neighborhood. The committee will also act as welcoming committee to new neighbors and new homeowners in OMG. OMG Digital Connections Committee: This committee will oversee the Oak Meyer Gardens website and social media platforms as well as a revival of OMG Acorn newsletter. Committee members will work in conjunction with the social committee to promote and spread word to our neighbors regarding events and ongoings in OMG. OMG Branding & Design Committee: The branding committee will work on updating and strengthening the OMG brand along with creating materials to promote and advertise neighborhood events. This can include work on the OMG logo as well as signage and banners for events such as dumpster day, summer social, neighborhood garage sale, etc. This committee will work in conjunction with the digital connections committee to layout and publish the OMG Acorn. If you are interested in getting connected or involved with a committee, please email HOA President Jerry Rowan (jerryrowan@gmail.com). 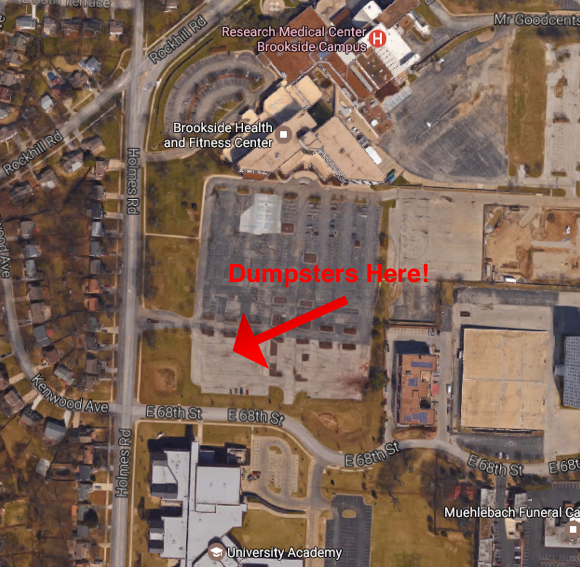 Our second Dumpster Day of the year is this Saturday. Don’t miss another chance for you to clean out your house and do a little fall cleaning. Get rid of that pile of stuff taking up unwanted room in your garage or basement. It’s also a great chance to clean up your yard and bring those piles of sticks or yard waste that has kept growing all spring and summer long. WHEN: Saturday June 18, 2016 from 8 AM – NOON. WHAT: We will have 2 trash dumpsters and a yard waste dumpster.